We arrived in Marquette on Tuesday but there was a bit of a glitch and we didn’t make it to Houghton that night. We got a rental car the next morning and went straight to the test road, which was near the Herman stage. I went out with Martin Headland for the first couple of passes using Steve LaRoza’s notes. When Ole arrived, we did a Recce pass to make our own. We went into town for a quick lunch and a chat before going hot. There was only a small problem, but everything went pretty well. Recce happened on Thursday. We left at 7:30 with the intention of being about ⅓ of the way back from the front car, and we were. A bunch of us missed a turn on one of the transits and some of the cars from further back got in front of us. It wasn’t too eventful… just a long day. On Friday, the rally started. The first car out was at 1:50 pm or so. SSS1 (Green Acres) is a super special in a gravel pit, and it’s a bit visually confusing at the top. There’s a left that tightens to a 3, but it’s farther out than one would expect. The rest is pretty straightforward. It’s only a mile and a half and then there’s a long transit to SS2. SS2 is Menge Creek run north to south. It’s a seven mile stage. The north end is tighter and more technical and the south end is much faster. The first couple of miles, we were moving along well and ended up catching the car ahead of us by mile three. (If we caught them in three miles being a minute back, we averaged 20 seconds a mile faster. While unlikely that we would have made up a full 100 seconds over the last five miles, just 60 seconds would have placed us about twenty places higher up on that stage). They didn’t realize we were behind them the entire time, and we couldn’t get around. The driver also let off the throttle before the red finish boards. Our time wasn’t dreadful. We came in on the same minute, and so did the car behind us who caught the train with about a quarter mile left. Next was a thirty minute service and then on to SS3. We were able to swap places with the car ahead of us before entering service after talking to the team, and they apologized for not seeing us back there. Since we were on the same minute, we just checked into service first. Stage 3 is Far Point, a twelve mile stage with spectator points and a few jumps. There was a massive delay when we arrived due to lack of medical presence, so we ended up transiting the stage. SS4 is called Teepee Tower and is fourteen miles long. It’s a fast stage. We averaged 60 mph and finished it only thirty nine seconds behind Tim in the R1 and thirty four behind Steve in the ST. We were definitely satisfied. Next was the day’s last service prior to the last four stages of the evening. SS5 (Estes Lake) was the first night stage. My pace was a bit slower… my lines weren’t as clean, but it was good start. There was minimal drama and for my first-ever night stage, it went pretty well. SS6 is Bob Lake. We were off to an awesome start. I’d cleaned up my lines and after you make the right turn, the pace picks up: crest, distance, crest, distance, mostly 5s and 6s, the occasional 4 plus. Around mile two, we’re flat out at the top of fourth gear over flat crest and there’s a quick L6. Our notes read “70 cr 50 R4.” The moment we came over that crest, we both realized that there is no way in goddamn hell we are going to make this corner. I’m on the brakes as hard as I can, only easing off to turn the car. We were way too wide and ended up smacking my driver’s side door, crushing it in. This wouldn’t have been a big deal if the next part didn’t happen. It would have ended with us back on the road, able to continue on. But that’s not what happened. There was another tree stump just ten feet later, and we center-punched it. This threw the car up into the air, rotating and finally landing tail to nose on the passenger side of the car. I didn’t stop trying to save it until the wheels were no longer on the ground. Once the car stopped, I quickly reached out to shut off the key but left the lights on. Behind us were Mitchell Kelly and Weston Bailey who stopped to help. Mitchell saw the car’s headlights through the trees and realized something was not right. They got out the triangles and tried to get us out of the car. The passenger side door was on the ground, and my door was in the air, but it was crushed. One more thing… we have crank windows. You need to have the door open to roll them down because the hand crank goes in the same place as the cage. Ole kept telling me that we had to open the door and yelling to Weston to get the door opened. He was on top on the car, trying, but he and I both knew it was not going to happen. I had my feet pressed against the door pushing upwards at the same time with no avail. I asked Ole, “Should we try to get out the back?,” and he kept insisting that it would never work and we had to get the door opened. Weston and Mitchell attempted to push the car back onto its wheels (which was more far fetched than us getting that door opened). Finally, Ole took his helmet off, tried to squeeze through the X, and made it. I was then able to release my cam lock and follow. Eventually EMS arrived and they transited the rest of the cars through the stage. Ole went to the hospital for his shoulder and to get a CT done since the final impact was greater on his side of the car. When we picked Ole up, we ended up at a bar in Baraga for an hour or so, where we got “dinner and a movie” (as phrased by the guy next to us) when a bar fight broke out, which apparently only happens annually. I had grabbed the notes before leaving the car for the night. I remembered a very fast section with lots of distances and crests, a L6, and then “cr 50 R4” but couldn’t pinpoint it in the notes. Ole couldn’t remember either, so we went up the next day to see what had happened. The distance after the crest was listed as 50, but it was more like 30. In addition, the speed we were carrying at the top of fourth gear meant that the notes needed to be “70 care braking cr into R4.” We missed it during Recce and it definitely came back to bite us. It’s not uncommon. Thousands of notes to go over all in one day definitely leaves a handful of notes that could have been improved… whether it be due to the lower speeds during Recce, the line you take (because of oncoming traffic), or anything else. 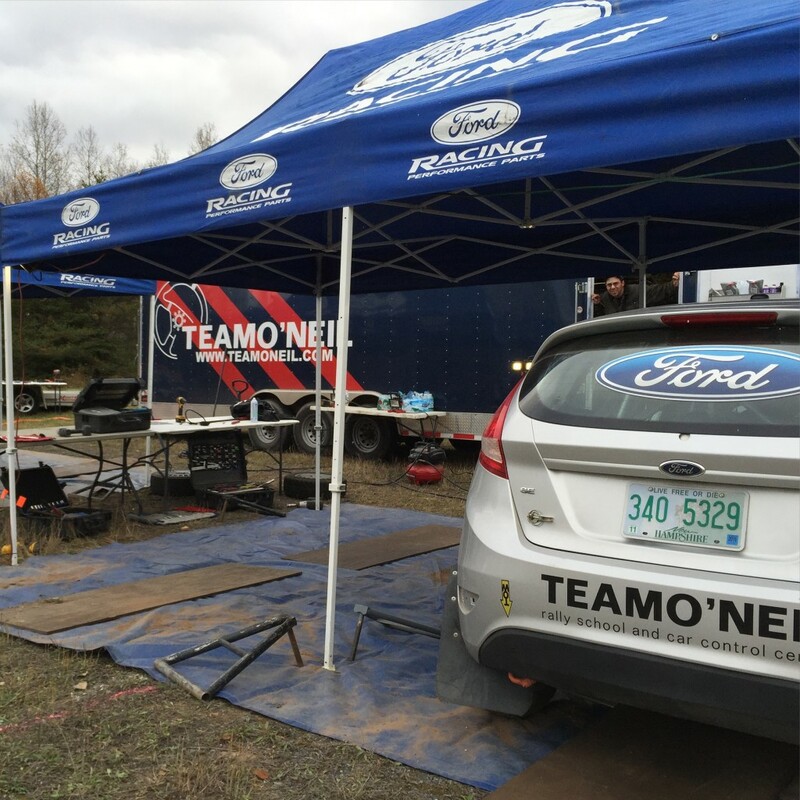 Cameron Steely and Preston Osborne had a mishap on the last stage that was product of the same error: a bad note and too much speed. The Jemba had a corner on stage 14 (Menge Creek S/N) that had a 4 listed as a 5 and they didn’t realize during Recce. He went wide, turned into the bank to prevent a rollover, went up the bank, hit a stump, and was thrown back down. 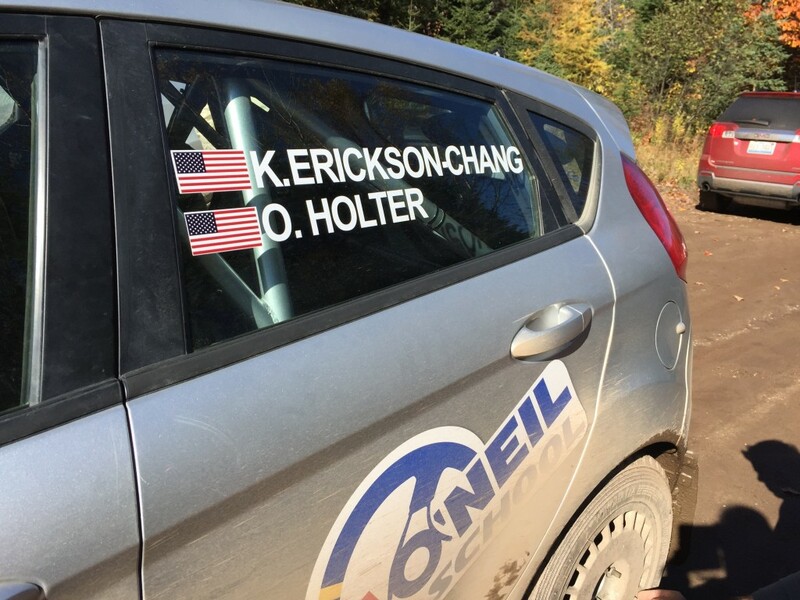 Of course, this was extra disappointing as they were first in 2WD by four minutes going into SS14. And after something like this? Well, you get asked a million times if you’re okay, and if you plan to come back. They tell you to get back in it sooner than later. In my experience, yes, it can be intimidating getting back in the car, but crashing isn’t that scary, and hasn’t kept me away. I’ve now tested two roll cages and they both worked. I would have finished the rally if conditions allowed. We had some really awesome first-rally moments and a not-so-awesome one. It was a learning experience that will help me improve. If you’re not getting better, you’re getting worse. So what do you do with a day of the rally left and no car? Go to Parc Expo, see the cars off, run to the crash site and do a secondary evaluation, head back for service, slink onto a stage, build a fire because you’re freezing and there’s a delay, and watch… and worry for each car that you expect to go by but doesn’t. I’ve known Keanna when she attended her first winter driving school as an observer before she was old enough to drive and watched her very quick progress as a driver in awe. I won’t forget the time at Lime Rock a couple of years ago when I was her instructor in the advanced run group. She was practically flawless. After a couple of sessions I asked her to “take it it up a notch” thinking she could learn more by getting closer to her limit. Well, she drove MUCH faster laps with essentially the same flawless techniques. I’m looking forward to her being my instructor soon!